Built at the expense of George Gough-Calthorpe, Lord Calthorpe in 1838, this is a large stone building in Early English Gothic originally designed by J J Scoles and comprises a nave, aisles, galleries and a chancel. 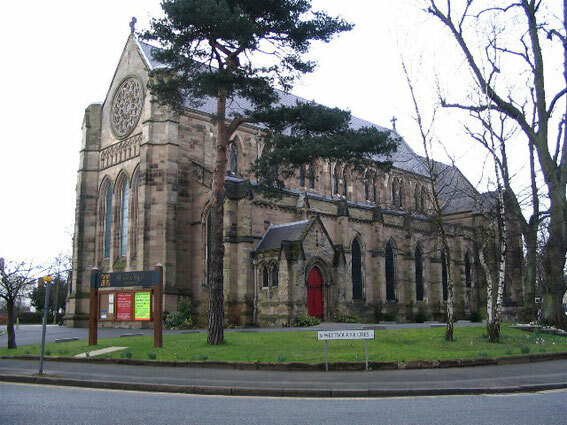 A parish was assigned out of St. Bartholomew's, Edgbaston in 1852. The chancel and a small north octagonal clock tower were added in 1856 by Charles Edge. Further enlargements (including interior woodwork) were made in 1885 by J A Chatwin who built a new nave and chancel on the site of the south aisle and changed the original nave and chancel into the north aisle and a Lady Chapel (1935). Chatwin's intended south tower was never completed. This lofty spacious church is richly ornamented in Victorian style with mosaic pavements, carved wood and stained glass including some windows by Hardman's of Birmingham. Historic England website - https://historicengland.org.uk/listing/the-list/list-entry/1211414. Take a look at Aidan McRae Thompson's photographs' of the church on Flickr - https://www.flickr.com/photos/amthomson/5372721583/in/photostream/.